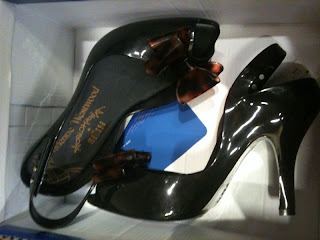 While perusing the Saks Fifth Ave Outlet yesterday I stumbled upon these amazing Vivienne Westwood Anglomania Melissa PVC pumps. In case you don't know Melissa is the shoe designer responsible for the PVC heel in which Alexandre Hershkovitz first marketed. Get them while their hot Yall. $59.99 and 30% off all shoes! I Love Melissa shoes! Where is there a Saks outlet? they are so gorgeous!! I want them! The Saks Outlet is in Opry Mills Mall!